In January 2019, 1,000 Azerbaijani tourists visited the Turkish resort province of Antalya, which is 39 percent more compared to January 2018, Trend reports via Turkish media. In January, 37,300 tourists from Russia visited Antalya, which is 75 percent more compared to the same month of 2018. In January 2019, Antalya was visited by 7,200 tourists from Israel, which is 18 percent more than in January 2018. The number of Iranian tourists who visited Antalya in January 2019 increased by 98 percent compared to the same month in 2018 and amounted to 1,600 people. In January, there was also an increase in the number of incoming tourists from Kazakhstan. 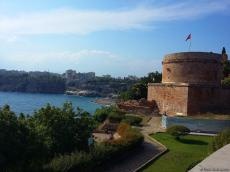 So 1,200 Kazakh tourists arrived in Antalya, which is 258 percent more compared to January 2018. Moreover, tourists from 135 countries visited Antalya and their number reached 142,300, which is 53.8 percent more compared to January 2018.